By far one the hardest decisions people have to make is whether to start saving money now or wait. The easy answer is to wait. "I need to pay off some debt first." "I need to work some stuff out first." Wrong, wrong, wrong... super wrong. Start saving now. I'll show you why. Money grows in investments. It's this magical thing called compounding interest. Debt also grows if you don't get a handle on it but it actually is limited to a fixed rate. Money grows faster than debt because of compounding interest. 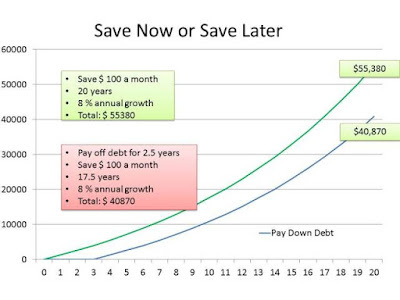 This is what a basic savings plan looks like with compounding interest. If you wait to start your investment plan. Like in this example it pushes your whole timeline to the right. Since investments grow faster later, the effect is toward the end. As you can see waiting to start your investment plan has a huge effect later on. This is the part that most financial planners leave out when they tell you to pay off your credit cards first then invest. The real answer is to start investing first and start to pay down your debt as you can. Investing is more important in the long run. The name for this is Opportunity Cost. Opportunity Cost is the cost of doing one thing over the other. So what happens to your debt? As long as you don't make it worse, it just turns in to a regular expense. Compared to your investments which continue to grow. This is not magic or voodoo, but it is important to know what the best course is. 1. Start saving money now. 2. Start to pay down your debt, slowly and responsibly. 3. The big thing is to not make your debt any worse. Just get it under control and start saving.